The Richmond Lunatic Asylum is mentioned several times in the novel. Gifford notes that Mulligan's "Dottyville" is a mocking name for this facility in NW Dublin, and that "Conolly Norman" was “a famous Irish alienist” (a student of mental disorders) who superintended the Asylum from 1886 to 1908. In Circe Bello notes that "Keating Clay is elected vicechairman of the Richmond asylum," and in Oxen of the Sun one of the medical students speculates that the man in the macintosh has been released from there. Mulligan mentions the asylum in connection with his mocking suggestion that Stephen has "g.p.i.," general paresis of the insane. 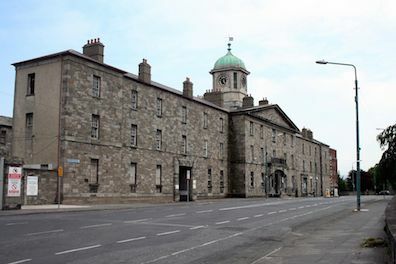 Joyce's fictional interest in insanity parallels Ireland's therapeutic interest in it; the country has a long history of building hospitals for the care of the mentally ill. Later in the 20th century this one became known more respectfully as the Grangegorman Mental Hospital, one part of a complex of buildings called St. Brendan's Psychiatric Hospital. The hospital complex has been progressively decommissioned in the last two decades, however, and much of it either lies in ruins or has been demolished. 2010 photograph by Quasihuman of the Richmond asylum, designed in the 18th century by architect Francis Johnston. Source: Wikimedia Commons.